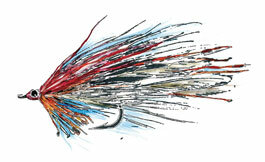 The Deceiver, as Jason Borger points out, is not just a fly pattern, but a whole family of fly patterns. Lefty Kreh authored the Deceiver in the late 1950s as a streamer that would be easy to cast in wind and would not “foul,” working from similar all-purpose saltwater patterns already created by anglers like Norman Duncan, whose “Inside Fly” may well have been the progenitor. (Duncan, by the way, was also the originator of the Duncan Loop knot, later popularized as the Uni-Knot.) Lefty’s original fly was an all-white pattern, but as Borger and Jeff Kennedy show this week, the fly lends itself to a variety of colors, materials and styles.